“Legal plastic content in animal feed could harm human health, experts warn” – Really? The quoted experts actually didn’t say anything about impacts on human health. The headline of the article claims that some experts have stated that “Legal plastic content in animal feed could harm human health”. Really? Nowhere in that statement is a link made between the plastic found in feed and human health. Most of it relates to the potential entry of microplastic into the bloodstream of an exposed animal (more on that below). If it all, the statement relates to the health of an animal fed with plastic-containing feed. But not to a human consuming the milk or meat of said animal. Again, if one looks at the quote, Stephanie doesn’t make a direct connection to human health. She does not say that the exposure scenario at hand (plastic in animal feed and subsequent consumption of the produced meat or milk) is of health concern. 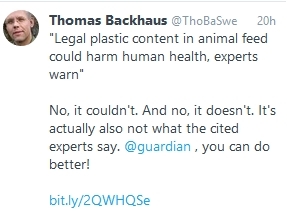 In summary, neither of the two expert actually seems to have made a statement that justifies the Guardian’s headline that “Legal plastic content in animal feed could harm human health“. Given, the headline reads “could harm human health” and not simply “does harm human health”. But the innuendo is clear, and not supported at all by the cited expert statements. Could there actually be a risk to human health? Which of course begs the question on whether there indeed might be a risk to human health, if one would either drink the milk or eat the meat of such an plastic-feed animal. I find that more than unlikely, for the simple reason that there is no human exposure. Humans simply do not come into contact with the plastic material unless one would actually eat the animal feed. The plastic is in the animal feed. That is, it enters the digestive tract of the animal – which is an organ system that has specifically developed to separate nutrients (carbohydrates, fats, vitamins, minerals, etc) from the unusable parts of the feed. And it is really good at doing that. So, unless clearly proven otherwise, one has to assume that plastic content in the feed simply passes through the animal body. But what about microplastics? Leslie is quoted as saying that “fine plastic particles cross the mammalian gut barrier and enter the bloodstream.” True. But, first of all, those findings are from animals highly exposed to pure suspension of microplastics (i.e. a really high exposure). Here we have an exposure where only a certain fraction of the plastic material occurs as microplastics (see the photo in the original article). Secondly, all the findings that we have so far are not quantitative, so we have no idea on whether microplastics actually cross the gut barrier to a substantial amount. A substantial amount of the macroplastic contained in the feed needs to be broken down to micro- and nanoplastic. Either during the processing of the feed, or during its ingestion by the animal. The microplastic then needs to pass the gut barrier into the animal in a substantial amount. The microplastic then needs to be transported via the bloodstream and deposited, in a substantial amount, into those parts of the animal that are actually consumed by humans (milk, beef, etc). The microplastic then needs to pass a second gut barrier in the human body in a substantial amount. The microplastic then needs to be transported via the human bloodstream in a substantial amount and deposited, in a substantial amount, in an organ where it could cause harm. Say liver, kidney, brain, etc. But how about chemical contaminants leaching from the plastic? Bisphenol A (BPA), which was specifically mentioned in Stephanie’s statement, is certainly a critical issue for human health. The compound is a plasticizer that turned out to be far more potent than anybody initially thought. So I would definitely not be surprised if one would find BPA-related effects in an animal that is brought up on a diet that contains 0.15% plastic. But, again, animal health was not the focus of the Guardian article, it was about human health. So the crucial question is whether such an animal would accumulate enough BPA in its milk or meat to cause an impact on human health. Which, as pointed out by Stephanie, might indeed be worth taking a closer look into. In any case, as Stephanie pointed out, humans (and animals) are exposed to BPA from a variety of sources, especially from an enormous range of food contact materials, other consumer plastics, the inhalation of indoor dust, and dental sealants. And even without having done the math, I would strongly suspect that indirect exposure to BPA via meat or milk from animals brought up on feed that is contaminated with plastic is only a minuscule contribution to the overall human body burden. In this context it might be interesting to note that the European Food Safety Authority EFSA is planning a re-evaluation of BPA starting in 2018, see here. It will be interesting to see whether that will result in a new tolerable daily intake (TDI). In the last evaluation in 2015, the TDI was lowered from 50 to 4 µg/kg bodyweight and day, i.e. the intake of BPA that is still safe to humans was reduced by more than a factor of 10. The risks posed traded off against the benefit Europe-wide of 3.5m tonnes of food going back into use is a logical and risk-assessed benefit that we should all think is a good idea. That is, we are down-cycling 3 500 000 tones of food (per year, I guess) into animal feed. Obviously, that is better than throwing it in a landfill – but it’s still an impressive waste of resources. In the end, I would argue that we should treat the occurrence of plastic in animal feed (or the occurrence of microplastics in human stool), in the same way as one would treat the finding of caffeine in drinking water: it’s not dangerous in itself – but it’s a sure sign that the whole system needs check and improvement (caffeine in drinking water would imply that sewage might be seeping into the drinking water supply somewhere). I already tweeted it, but just for the record: I don’t think that there is a risk from human health from the plastic found in animal feed. But I certainly would argue that we need to wean us off of our excessive plastic use. Plastic use in consumer items such as food contact materials certainly leads to actual exposures to BPA, but also phthalates and a variety of other plastic-associated chemicals, which might have real human health impacts. And, in parallel, we urgently need to improve many of our waste management systems, in order to minimize emissions of plastic items into the environment. We should not only be motivated by threats to our own health, but especially by the very real impacts on the environment as well as the enormous waste of resources that accompany our often thoughtless and sometimes mindbogglingly excessive use of plastics. The routine occurrence of plastic in animal feed, human stool, and basically every nook and cranny of our planet is a clear indication that we need to step up our game.